There has been a lukewarm reaction to the UK government's strategy on microgeneration, launched on Wednesday. The strategy aims to create conditions under which household or community generation of electricity becomes "a realistic alternative". While some industry figures have welcomed the strategy, others say it is short on concrete action and funding. They say it will keep the UK behind countries such as Germany and Japan in uptake of these technologies. The government believes technologies which work on the scale of households, small businesses and communities can help bridge Britain's coming energy gap while reducing carbon emissions. The chief executive of the Micropower Council, Dave Sowden, found much in the strategy to welcome. "Following last week's announcement of £50m extra funding for microgeneration [in the budget], the government is to be congratulated for this strategy which contains many of what we believe to be the necessary measures for consumers, through adoption of microgeneration, to become a substantial part of the solution to the UK's numerous energy policy challenges," he said. Other observers were less convinced. "A large number of the 'actions' in the strategy are not actions at all, if by that we mean proposed concrete steps to deliver real policy changes," said Seb Berry, head of microrenewables at the Renewable Energy Association. "A large number are contingent on further research and review - eg 'DTI will undertake further research and analysis', 'DTI will investigate', and 'Defra will look carefully at'," he said. "What the strategy doesn't do is spell out what policy mechanisms were used, or more importantly why they are felt inappropriate for the UK," said Mr Berry. 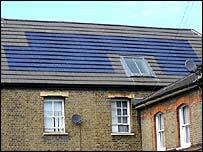 The UK can muster a total of 82,000 micropower installations, of which 78,000 are solar hot water heaters. Some observers have criticised the strategy for not tackling planning regulations, which mean micropower schemes can be blocked by objections over noise and other issues. A further criticism centres on the lack of firm measures to reform the grid distribution system so it can accept feeds from a large number of tiny generators. Matthew Spencer, chief executive of Regen SW, the renewable energy agency for the southwest of England, described the strategy as "a great disappointment". "Fourteen of the 24 actions in this document are no more than commitments to further studies," he said. "This is definitively not the dynamic new drive for low-carbon home generation we were promised." Within a few months the DTI is expected to launch its review of overall energy policy. How green was Brown's Budget?